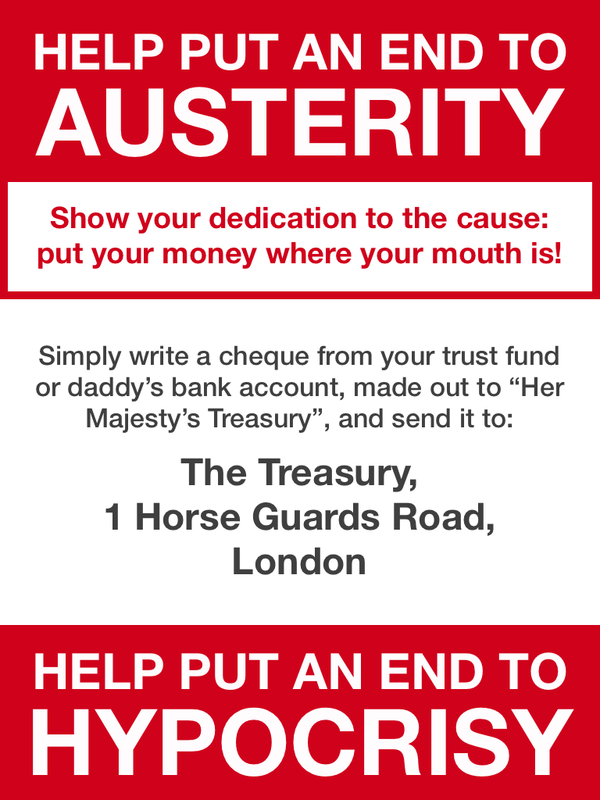 The Devil's Kitchen: End austerity and hypocrisy now! 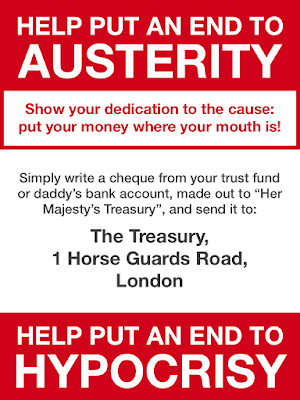 End austerity and hypocrisy now! Your humble Devil notes that there has been another Corbyn inspired agitprop march today. 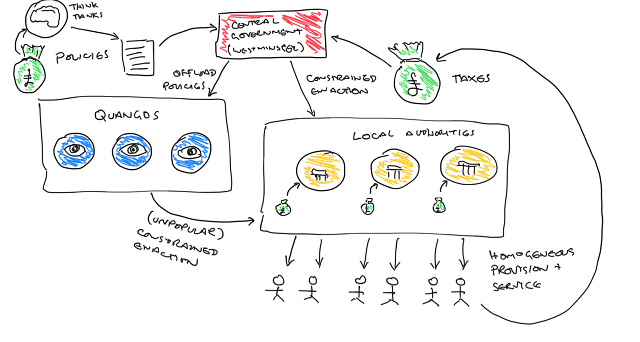 Unfortunately, I had something else inconsequential to do, so was unable to make it. Probably about time there were some counter protests to Corbyn's brown shirts. I'd happily join in if at a weekend. It costs £500 to register as a candidate to be an MP. For that you get one free mailshot. 78,000 voters in my constituency. So send every consitutency a letter, formatted as final demand and a statement of account from HMRC. FINAL DEMAND and STATEMENT OF ACCOUNT. IF YOU DO NOT PAY WE WILL TAKE YOUR PROPERTY AND ASSETS AND JAIL YOU. We apologise for our past accounting errors where we left all bar one off the books. However, we spent the money so you owe it. Will there be an outcry? Certainly. Can't tell the plebs what MPs have done. Lord Blagger - excellent idea! Lord Blagger, you forgot the money pissed away on foreign aid and teat-sucking NGOs and fake charities. Sadly the website fakecharities.org has been taken down.